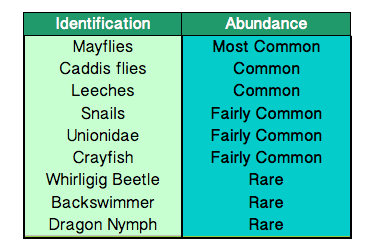 Thirteen species of aquatic plants (macrophytes) collected using a garden rake and identified in 1994. Aquatic plants were notably sparse in Fumee Lake. There is a lack of organic substrate to allow plants to take root over much of the bottom of Fumee Lake. Submerged vegetation was found near the deepest part of the lake and near the edges. Floating and emergent vegetation was found in the littoral zone. There are sufficient plants in Fumee Lake for the fish population. Five fish of three size categories were caught with hook and line and preserved by freezing. The sizes taken were under 8 inches, 8 to 12 inches and larger than 12 inches. These fish were very vulnerable to fishing as the lakes have been closed to recreational fishing for over 100 years. Several fish over 18 inches were caught but were not kept. Scales were taken, and lengths measured for all fish caught. The number of rings on the scales are counted to determine the ages of the fish. The age of the fish along with their lengths are used to compute growth rates. Smallmouth bass in Fumee Lake and Little Fumee Lake have growth rates that are better than the Michigan state average for smallmouth bass. The fish were analyzed for toxic contaminants. The contaminants levels in these fish were found to be similar to those in Lake Superior, meaning the contaminants come mostly from atmospheric deposition rather than direct inputs as is the case in Lake Michigan. The concern is for the fish and the animals that eat the fish. The top level predators often suffer from the impacts of these contaminants. The concentrations of DDT, DDE and PCB in the smallmouth bass tested appear to be high enough to be of concern regarding their consumption by and impact on eagles. Additionally, the mercury concentration in many smallmouth bass taken from Fumee Lake exceeded 0.5 ppm which is the "trigger level" used by the Michigan Department of Public Health in issuing "restrict consumption advisories".